CATDOG IS SCHEDULED TO PLAY A NEVER BEFORE IN USA EPISODE TODAY AT 6:30PM EASTERN! Hi ho diggety news! Welcome to the new generation of new CatDog leaders! Visit the brand new The Amazing CatDogman FORUM! At last a place for fans to commune that will be active! Hosted by Melissa! Best of luck on your new forum Melissa and I hope you get lots of members! Hope you like the banner I made for you. Well it took longer than expected but been having net troubles, and other obbligations, the list is now definatly closed. 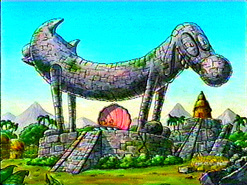 I hope that someone will take my place and give CatDog fans a nice place to go and discuss the wackyness of Nearburg. 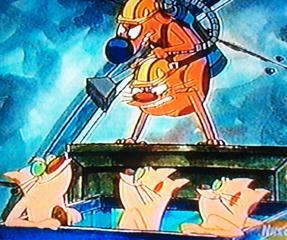 Best of luck to all CatDog fans and I thank you all that I've met and contributed on the list over the years. Any fans out there, that have a place to go for catdog and would like it advertised here, just email me and let me know, and I will put a link up here for it. CatDog needs your support. Dr. CatDog says thanks for the letters and questions! Issue #5 is ready, for your pleasure and comfort. It's never too late for Easter.......eggs! In the tradition of DVD Easter eggs I thought it would be clever to add hidden colorful eggs to hatch all over my site. Since I have some trivial knowledge of CatDog and behind the scenes, thanks to crew I've met, and all sorts of different CatDog collectables such as all the books, I thought it would be fun to hide some small pieces of CatDog trivia that not the usual fan knows. I will keep you up to date with how many eggs are on the site. Currently there are 6 eggs. They aren't hard to find at all, could be just some random phrase linked, or a picture linked, anywhere on the site. Best of luck finding them. and enjoy breakfast! relax with a good book and classical polka! You're an independent thinker and very smart. Are you Cat or Dog, on CatDog? Which Greaser member are you, from CatDog? Nickelodeon and Peter Hannan Productions. bring CatDog to the wonderful Nicktoons collection! This CatDog site is fan based only. I'm not affiliated with Nickelodeon. Nickelodeon's main site is located here at: "Nick.com"
property of Kristen the site owner. Copying any of the text is not permitted."